The first thousand words of this historical mystery won a prize for its author in London, but I almost stopped reading after the first chapter. 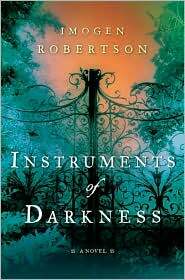 Imogen Robertson redeemed herself as she continued with a tale of murders and forensic experts in Instruments of Darkness. Like any good murder mystery, the dead body begins the action; the first is discovered in the woods of Sussex. Robinson infuses a Gothic mood and English society manners into this late eighteenth century melodrama, with the American Revolution and the week-long mob scene in London, called the Gordon Riots, pitting Catholics against Protestants, adding to the excitement. The key investigators are the unlikely team of Gabriel Crowther, an anatomist (not quite forensic scientist, but close enough) with a hidden past, and Harriet Westerman, feisty and intelligent wife of a Naval officer gone off to fight the war in the colonies. The two complement each other, straying from British formality only when examining the dead bodies for clues. The action is all very civilized as they investigate key suspects – one, the gloomy and rich Hugh Thornleigh, brutally scarred by the war, who lives on the neighboring estate, and may be related to more than one dead body. Robertson confounds the plot by flipping back and forth to another murder scene – this time in a small music shop in London; Alexander Adams, the shop owner, is fatally stabbed in front of his two young children. A family crested ring immediately links the two murders. The action starts slowly, with Robertson carefully embellishing each character. As she seems to have so much to tell about each character, she struggles to reveal all the information at once. Everyone has a past that catches up to the action eventually, and, at times, Robertson allows the historical context to take over the plot. The think-out-loud conversations of her characters can be more confusing than helpful, as she draws your attention back and forth, and away – red herrings? She throws in another murdered body now and then to keep your attention. If you can be patient with the British understatement, and weave through the convolutions, you’ll get to an Agatha Christie type explanation and a surprise who-done-it ending. The book is more about the relationships and the problem-solving, than it is about the murders. I did enjoy the repartee between Harriet Westerman, a woman before her time, and Gabriel, a steady and equal partner – at a time in history when it was more likely to be two men on the case. Robinson has established a new forensic team of sleuths; she is already planning the next adventure of Westerman and Crowther. This entry was posted in American history, book review, books, mysteries, reading and tagged Alexander Adams, American Revolution, Gordon Riots, Historical whodunnit, Imogen Robertson, Instruments of Darkness, London, Murder Mystery, Thornleigh New South Wales. Bookmark the permalink.